Move your Business forward with world’s Best ERP! Witness how eNoah is helping small and medium businesses (SMEs) with SAP Business One & HANA. ACMEE 2018, 13th International Machine Tools Exhibition, the biggest exhibition on machine tools will be organized by Ambattur Industrial Estate Manufacturers Association (AIEMA) in Chennai Trade Centre, Chennai, India during 21 – 25 June 2018. 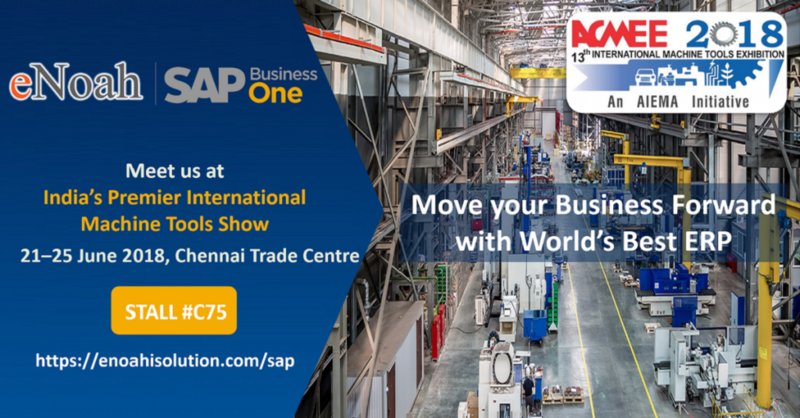 Visit us at Stall #C75 to explore more about SAP Business One.